It is not so much the cross that is the symbol of Christianity, but it is the empty tomb. F. F. Bruce said, and I paraphrase, “If there had been no resurrection we probably should never have heard of Jesus Christ.” He would have been just another dead philosopher among others. Without the resurrection of Christ there would be no preaching of the Gospel, there would be no foundation on which to build and preserve the church throughout the centuries. 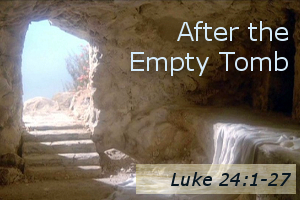 The world and all of humanity, even heaven, would never be the same after the empty tomb.